On Wednesday President Trump held a listening session at the White House for students and parents affected by school shootings following the recent massacre in Parkland, Florida. 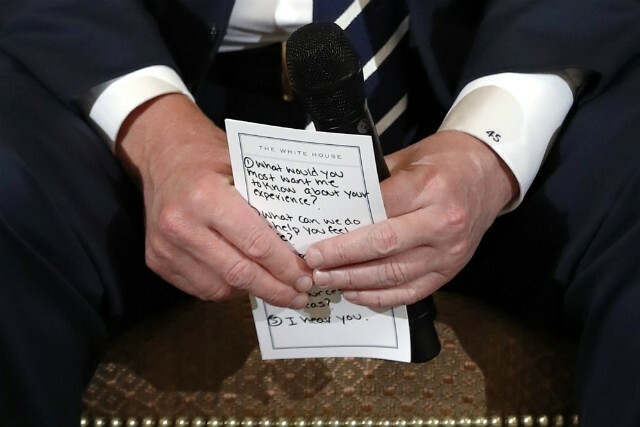 While the president listened to grieving parents and students plead with him to make meaningful changes when it comes to student safety, eagle-eyed Associated Press photographer Carolyn Kaster snapped a shot of the handwritten notes Trump used to navigate the meeting. Andrew Pollack, a parent mourning the shooting death of 18-year-old Marjory Stoneman Douglas High School student Meadow Pollack, made a particularly strong impression at the summit. “Fix it!” Pollack told Trump. We hope the president heard him.